Playing sport as a woman can be challenging, and even impossible in some situations so it's disappointing that the International Basketball Federation has ruled against hijabs. The Asian Games are taking place at the moment, and while most federations allow hijabs or modified veils FIBA have said No. 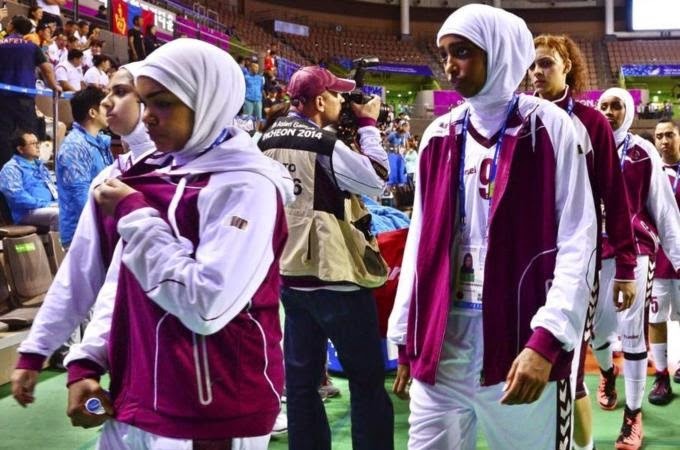 Their rules ban "headgear, hair accessories and jewellry"
And as a result the Qatari team are now out of the competition. A competition whose slogan is 'Diversity Shines Here'. One of the players Ahlam Salem M Al-Mana told Reuters: "We have to take this stand. We knew about the hijab ban but we have to be here. We have to show everyone that we are ready to play, but the International Association is not ready." If you're interested in knowing more about the challenges facing women in Muslim countries, and their successes Sertaç Sehlikoglu has a great blog Muslim Women in Sport.